The protests may not have looked like much: a couple of hundred people gathered on the street outside the bus station a few blocks from the center of the city, with speakers taking turns on a megaphone demanding the resignation of a handful of police officials. But for Nagorno-Karabakh, this is close to an uprising. The unrecognized republic – accepted internationally as part of Azerbaijan, but controlled since 1994 by ethnic Armenian forces – is not a place that sees much public dissent. The difference, Grigoryan and others say, is Armenia and its “Velvet Revolution,” the movement which upended politics in Yerevan a month ago by ousting longtime leader Serzh Sargsyan and replacing him with the protests' leader, Nikol Pashinyan. The influence of the events in Armenia on the protests in Karabakh were clear: Protesters used cars to block off roads, as they had in Yerevan, and chanted “Nikol, Nikol.” Between speakers, the sound system played many of the same songs that became popular during the Yerevan protests. “There has been a kind of inspiration from Yerevan, and a desire that some change happens here as well,” said Masis Mayilian, Karabakh's de facto foreign minister, in an interview with Eurasianet. “Society has become more open here, and that's the influence of what happened in Yerevan,” said Hayk Khanumyan, a member of parliament from the National Renaissance Party. The protests broke out after two young men were beaten badly by a large group of special forces police. Protesters complained that Karabakh has long suffered under a culture of impunity for the security services, and demanded the resignations of four senior police officials. Thus far there have been no concessions by the government, but the territory's de facto president, Bako Saakyan, and other senior leaders have met with protesters and promised to carry out a thorough investigation into the incident. The system in Karabakh is even more autocratic than the one that Pashinyan toppled in Armenia: Khanumyan is the only opposition MP in the 35-seat National Assembly, there is no independent media, and power is highly concentrated in the de facto president. “If someone needs to get their roof fixed, they write a letter to the president,” Khanumyan told Eurasianet. But there is also a widespread belief among Karabakhis that the de facto state needs to be run by a strong hand, given the existential security threat that they believe Azerbaijan poses. Azerbaijan considers Karabakh to be its territory, and regularly threatens to take it back by force. The threat was heightened after a period of intense fighting in 2016, known as the “April War,” in which more than 200 people were killed and Azerbaijani forces took some territory for the first time since a cease fire was signed in 1994. “The number one issue that people have here is security, and that was reinforced by the April War, and reinforced by the hate speech that is seen in Azerbaijani society,” said Ruben Melikyan, the state human rights ombudsman. 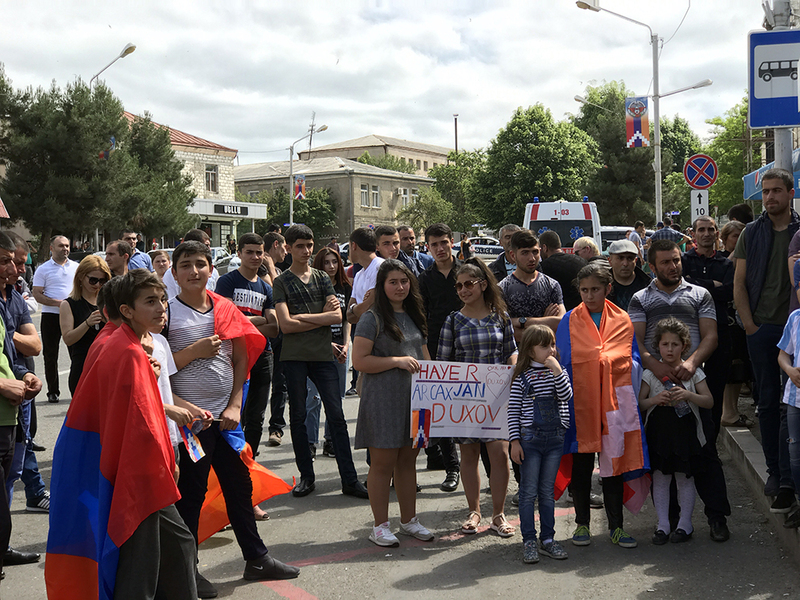 Two days after the protests started, pro-government veterans groups organized a counter-protest on the main square of Stepanakert, Karabakh's de facto capital. “We should have one task – that is the security of our state, and we shouldn't be distracted by other issues,” said one of the speakers, Abo Badasyan. The territory's small opposition, accordingly, is keeping its demands more modest than Pashinyan did in Armenia. “We think changes can come by evolution,” Khanumyan said. Beyond the protests' goals of the resignation of the security officials, Khanumyan said reforms need to include a decentralization of power and greater public oversight of the budget. “We don't need to have a complete change of power like they had in Yerevan,” he said. 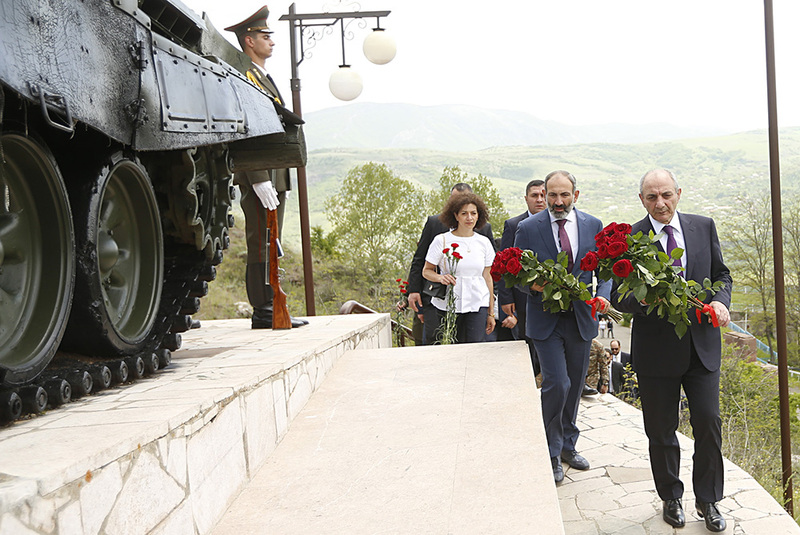 Many in Karabakh were initially suspicious of Pashinyan and his revolution in Yerevan. While protests eventually spread from Yerevan to other cities in Armenia, they didn't make it to Stepanakert. “There was some concern that instability in Armenia could lead to insecurity in Karabakh,” Mayilian, the de facto foreign minister, said. The government already has been making steps toward reform. Authorities have abolished the longtime monopoly enjoyed by the territory's only mobile provider, Karabakh Telecom, which had been unpopular for its high prices and poor service. On May 31, de facto State Minister Arayik Harutyunyan announced that three mobile operators in Armenia would be invited to set up business in Karabakh. The move followed a Facebook campaign against the monopoly that began in mid-May, and small protests in the town of Hadrut. And the parliament has promised to set up a special commission (including Khanumyan, the opposition MP) to collect complaints from citizens and a “public council” to increase communication between the government and citizens. The protests over the police beatings also have been resolved, at least temporarily, in a top-down manner. 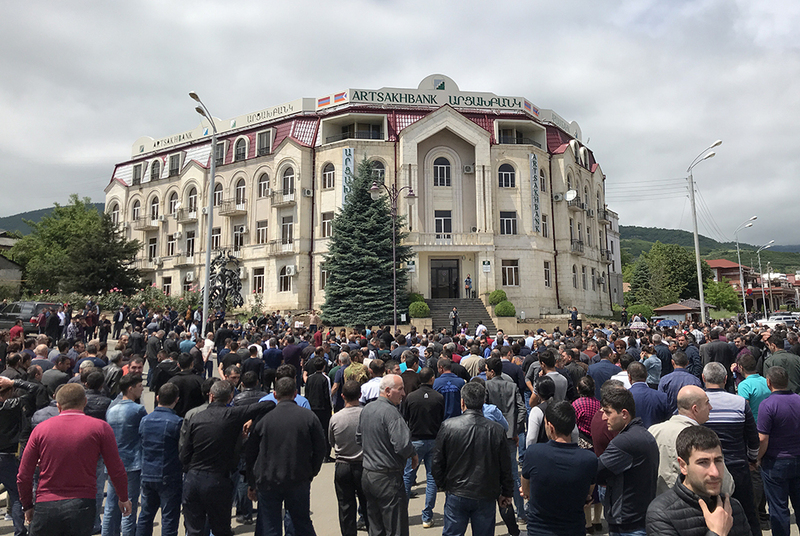 Pashinyan, in a June 4 video address on his Facebook page, called on the protesters in Stepanakert to take a break and give the government time to respond through its investigation. “The consensus has been reached as a result of long, detailed, calm, fraternal discussions and I think it is necessary to give an opportunity for the fulfillment of those agreements,” he said.